PR: Apple has enhanced its PowerBook G4 line of notebook computers for business and creative professionals with higher-resolution displays and up to one hour more battery life on the 15" and 17" models. * In addition, every new PowerBook now includes a DVD burning SuperDrive with prices starting at just $1,499. "The Apple PowerBook continues to deliver the ultimate in portability, performance and innovative features," said Philip Schiller, Apple's senior vice president of Worldwide Product Marketing. "Our mobile customers are going to love working on the new high-resolution PowerBook displays and appreciate the added productivity that one more hour of battery life delivers." The new higher-resolution PowerBooks provide significantly more screen real estate and include the 17" PowerBook with a 1680 x 1050 pixel resolution - 36% more than the previous generation - and the 15" PowerBook with a 1440 x 960 pixel resolution - 26% more than the previous generation. Ideal for business and creative professionals, the new 15" and 17" PowerBooks make reading text and viewing images even easier with brighter displays - up to 46% brighter on the 17" model. The 15" and 17" PowerBooks also provide up to an additional hour of battery life to get even more work done while on the road. The PowerBook line includes three models: the 1.5 GHz 12" PowerBook with an 8x SuperDrive and the new 1.67 GHz 15" and 17" PowerBooks with an 8x SuperDrive with double-layer support. Both the 15" and 17" PowerBooks include ATI Mobility Radeon 9700 graphics with 128 MB DDR dedicated video memory and now feature built-in Dual Link support to drive Apple's groundbreaking 30-inch Cinema HD Display as an external monitor, providing more than four million pixels of additional workspace. Every PowerBook includes built-in Bluetooth 2.0+EDR (Enhanced Data Rate), integrated AirPort Extreme 54 Mbps 802.11g WiFi wireless networking**, a scrolling trackpad and Apple's Sudden Motion Sensor technology. Mac OS X version 10.4 "Tiger," the fifth major release of the world's most advanced operating system and iLife '05, Apple's award-winning suite of digital lifestyle applications, are included with every PowerBook. Pricing & Availability The 12" and new 15" and 17" PowerBooks are available immediately through the Apple Store, Apple's retail stores, and Apple Authorized Resellers. Additional build-to-order options for the 12" PowerBook include the ability to upgrade to 100 GB (5400 rpm) hard drive, up to 1.25 GB DDR SDRAM, a slot-load Combo (DVD-ROM/CD-RW) optical drive, and the AppleCare Protection Plan. Additional build-to-order options for the new 15" and 17" PowerBooks include the ability to upgrade up to 2 GB DDR2 SDRAM, a slot-load Combo (DVD-ROM/CD-RW) optical drive, and the AppleCare Protection Plan. The new 15" PowerBook also offers a 100 GB or 120 GB (5400 rpm) hard drive as a build-to-order option. *Battery life depends on configuration and use. "Intel showed off its new Robson cache technology yesterday, when it gave a demonstration using a laptop that booted up almost immediately. The laptop in the question was equipped with a nice chunk of NAND flash RAM, which made the super-speedy startup time possible. As part of the demonstration, Intel also launched several applications from the flash drive, including Adobe Reader in 0.4 seconds and Quicken in 2.9 seconds. "Any seasoned road warrior will tell you that when it comes to draining your laptop battery, there's nothing like a constantly spinning hard drive. Intel's Robson cache technology attempts to ameliorate the problem by moving frequently accessed data over to the flash RAM. According to Intel, Robson is at the point where it could be shared with laptop makers, although the company declined to go into detail about how the technology works." PR: The Plasticsmith, Inc. today announced the release of Lapvantage Loft, a laptop stand designed to improve computing ergonomics while offering a sleek minimalist design. The Loft is a full-featured desktop enhancement unit for anyone whose notebook doubles as a desktop computer. It swivels 360 degrees and sports an extra-thick polished acrylic platform in either iridescent blue-edged, clear or opaque white. 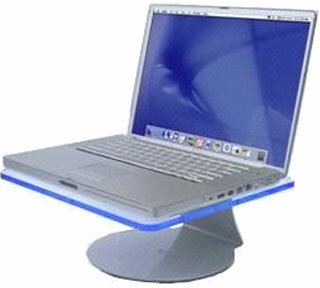 The steel pedestal is available in black or metallic, designed to complement Apple's PowerBook line. More and more people are replacing their desktop computers with laptops. But the inherent design of laptops - a fixed screen and keyboard - violates the most basic ergonomic guidelines. Now laptop users no longer need to compromise on comfort. The Loft lets you show off your laptop while at the same time providing you the ergonomic benefits of optimal viewing height, improved posture and enhanced functionality. Its small footprint saves valuable desk space and allows you to tuck an external keyboard under the platform. This keeps you close enough to your laptop's screen for comfortable viewing while preventing neck, shoulder and back strain. What's more, you can swivel the Loft to your heart's content, making it easier to plug in peripherals and allowing you to more smoothly turn your laptop screen for presentations or simply showing your work to a colleague. It comes with 3M rubber feet that attach to the top of the platform, keeping your laptop running cooler. Now you can enjoy the benefits of ergonomics and the look of magic with either the shimmering blue-edged platform that radiates a polychromatic effect, the clear platform that creates its own lighting or the opaque white platform with its clean, modern look. And because safety is everything, the Loft is sturdy enough to support most laptops and engineered to be exceptionally stable, weight tested to support 15 lbs. The Lapvantage Loft is available in 6 combinations - metallic base/blue platform, metallic base/clear platform, metallic base/opaque white platform, black base/blue platform, black base/clear platform, black base/opaque white platform. It is selling at the introductory price of $79.95 and sold exclusively at The Plasticsmith's online store. We've all loved the WallStreet. But sometimes it's a bit slow. So we decided to overhaul it, and with the Avanti upgrade, we're sure you'll be happy with your PowerBook once again! We've taken the PowerBook WallStreet, inspected it from head to toe, and we've found a great way to speed it up! Good for Mac OS 8.1 through Jaguar!! The bottom line is, will this thing function? The answer is yes! We have been able to reduce processor heat by nearly 50% cooler than even the G3 PowerBook Pismo! Our processor operates at a balmy 50°C (that's 121°F for you Americans!). And cool is good - this means great reliability for your processor, and excellent performance for you! Since our system upgrades don't require ROM updates, software installation, or any other drivers, you're guaranteed complete 100% compatibility. No need to install ANY software at all! Just plug in the upgrade and restart your computer! Many folks who've bought upgrades requiring ROM installation have experienced problems, requiring them to return the units for reworking. By comparison, our upgrade utilizes the original Apple ROM, therefore completely bypassing the ROM issue, and guaranteeing you complete hassle-free service! Now one unit fits all WallStreet models! WallStreet Series 1 or WallStreet Series 2! Kit includes processor, installation photo-guide, and upgraded heat dissipation panel. Low power consumption, excellent heat dissipation. Our upgrade gives you performance surpassing PowerBook Titaniums! With the unique 1 MB L2 cache level at 250 MHz, the performance surpasses all of the early Titaniums, and with our low-power consumption design, you'll see longer battery life, more horsepower, and a cooler running processor than you have ever had before! 100% compatibility with OS 9 and OS X - Jaguar, Panther, Tiger! Easy, 10 minute installation with our kit! Order the upgrade and we'll install (you ship to us): $239. You ship your PowerBook in, we'll install & return it to you. Overnight Full Service: $349. We'll pickup your machine, and have it back in your hands in 48 hours upgraded! Enter your phone number in the Notes section (during checkout), and we'll call you to arrange pickup same day if possible! Options: Need more RAM? A larger hard drive, Combo drive, or our exclusive SuperDrive? No problem -just order with your processor, or call us when you send your machine - we'll install any extra components from our site at no extra charge. PR: IOGear introduces the first Dual Port Hi-Speed USB 2.0 PCMCIA CardBus card for Macintosh and PC notebook computers. 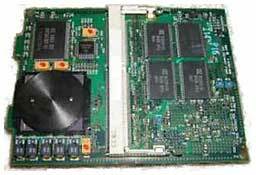 IOGear's USB 2.0 PCMCIA CardBus card auto configures and requires no additional drivers. 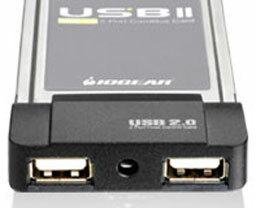 IOGear brings the cutting edge technology of USB 2.0 to your Macintosh PowerBook or PC Laptop. You will enjoy the convenience and newfound speed that has made USB an industry standard. IOGear's USB 2.0 PCMCIA CardBus card will allow you to easily add up to 127 simultaneous USB 2.0 and 1.1 devices. This device will fit into any PCMCIA CardBus slot. IOGear's USB 2.0 PCMCIA CardBus card will fit the need of any mobile professional who needs the speed and convenience of USB 2.0. PR: The Milano leather case that is as slim and full-featured as your new PowerBook. 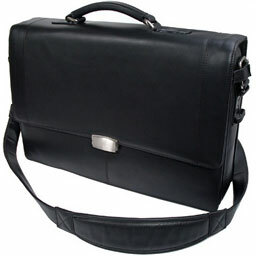 This high-quality leather case is geared to the executive who wants a slim, stylish case for business use. Crafted of high-quality cowhide leather, the Milano comes in a 12", 15" and 17" version to ensure a custom fit for all PowerBook models. The 12" and 14" iBook also fit nicely in the respectively sized cases. The Milano is a tight design that avoids the bulkiness found in most other cases. The Milano has a comfortable, padded non-slip shoulder strap with an attachment for your iPod, digital camera or cellphone. Or you can go strapless and carry the case by its rugged handle. The buckles and handle connectors are all-high quality solid stainless steel hardware. The interior features a padded laptop pocket, lined with soft plush fabric. A smaller pocket holds your non-digital documents and folders. There is also a pocket for your extra batteries, cables, adapters, etc. The back of the case features a large open pocked for quick access to magazines, plane tickets or other quick-reach items. The Milano is a slim design with enough storage for the "on the go" professional. Matter of fact, it is so sleek that most people won't even realize that you have a laptop in your bag.